The shift from platform to solution focus. Look for this to evolve in the coming months as Esri will be placing a renewed focus on bundling configurations of the 450+ information products into solution offerings helping organizations solve real problems quickly. GISinc is excited to partner with Esri in this endeavor as solutions are what deliver value to our customers. See an example of what this will look like here. Utility Networks for all water-based utilities are here, and migration paths exists. Asset packages are released for water, storm and sewer, and requirements for using the Utility Network have been updated. You better get familiar with Portal (ArcGIS) because it’s becoming part of everything Esri is rolling out. ArcGIS Indoors is an important new product that provides powerful new indoor mapping capabilities. Work Smarter Trend: Steve Mulberry of GISinc spoke at Cityworks’ booth and caused such a crowd that the talk was repeated the following day due to demand. The topic? Work Smarter with Sensor Networks – Join his webinar on August 16, 2017. AI is coming! Esri continues to work with Microsoft to incorporate AI into image analysis. Since last year’s UC, street level photos are being tested to detect blight and the results so far are positive. Insights is not yet compatible with ArcGIS Enterprise 10.6.1. Insights for ArcGIS will be fully supported on ArcGIS Enterprise 10.6.1 in September 2018, with the 3.0 release (per official statement from Esri). Cobb County, GA created a brewery & distillery tour story map. While this is not revolutionary, the fact that it got their executives very interested in what else GIS could do is worth mentioning. “Sites” are a light-weight addition to ArcGIS Enterprise but pack a heavy hit. Tailored sites within a single Enterprise give teams and departments flexibility to extend their presence without having dedicated architecture to support it. ArcGIS integration with SAP HANA – This will enable SAP HANA customers to leverage the power of this industry leading cloud platform to deliver Esri-based location services. 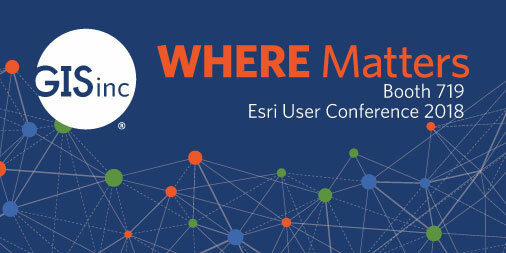 Were you at this year's Esri UC? You may have participated in our "Where will GISinc Take You?" giveaway. One lucky winner guessed there were 2125 monkeys in the barrel - which was the closest to the actual number of 2150!